Now that a SAS data set that contains variables of interest is on the server, you can call any SAS procedure to analyze the data. In order to tell the IMLPlus language that you want certain statements to be sent to the SAS System rather than interpreted as IMLPlus, you must bracket your SAS statements with SUBMIT and ENDSUBMIT statements. Add the following statements at the bottom of the program window, and select Program Run from the main menu. When you run the program, SAS/IML Studio calls the REG procedure with the CORR option. 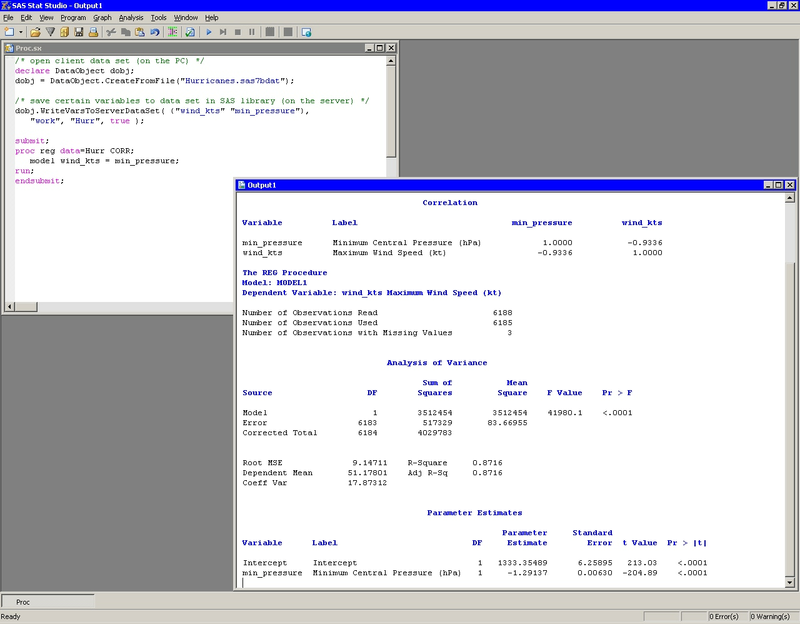 The CORR option prints out the correlation matrix for the variables in the MODEL statement. The REG procedure displays its tables in the SAS/IML Studio output window as shown in Figure 4.1. From the output you can see that the correlation between these two variables is . The R-square value is for the line of least squares given approximately by .